Posted in General and tagged cows, fauna on Saturday, 28 September, 2013 by Paul. It doesn't have horns, not even stubs, and I can't spot an udder - so even though to me she looks like a cow, I'm guessing this is a bull. Do cows ever not have udders, and do bulls ever not have horns? 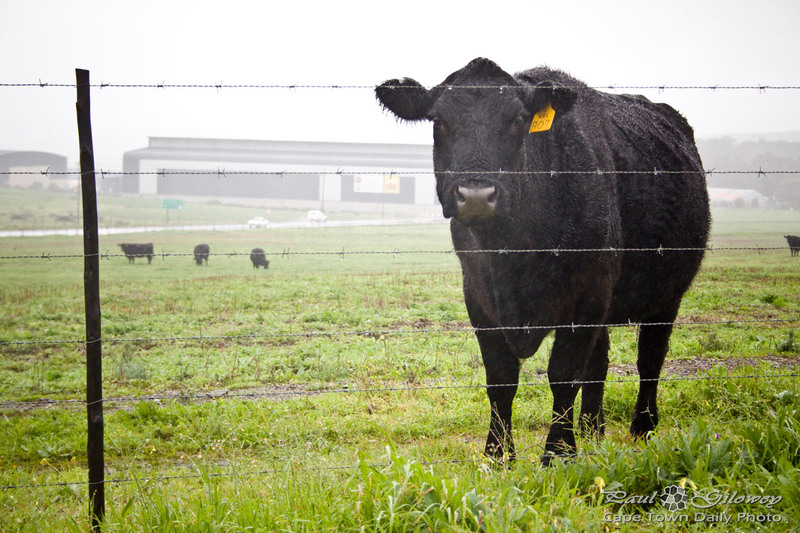 Posted in General and tagged bull, cow, fauna, fence on Friday, 13 July, 2012 by Paul. 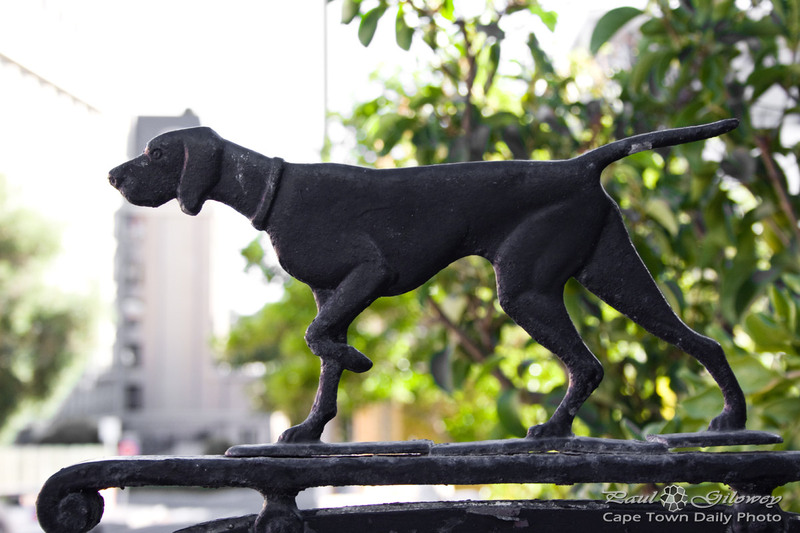 Posted in General and tagged dogs, fauna on Friday, 16 March, 2012 by Paul. In my previous post I showed you a photo of a cat that I snuck up on while it was having a dispute with a cat on the other side of a gate. 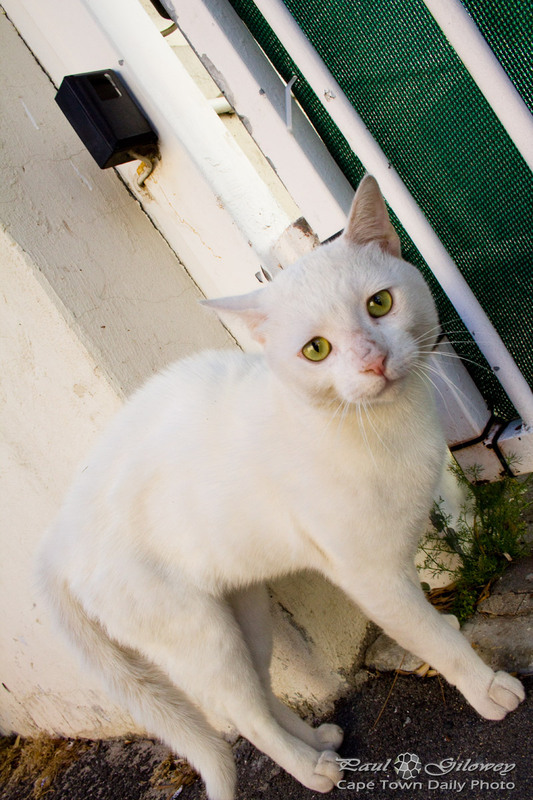 I stuck my camera in under the gate and got this photo of the cat that was (allegedly) being extremely disagreeable. Posted in General and tagged cats, fauna on Thursday, 15 March, 2012 by Paul. 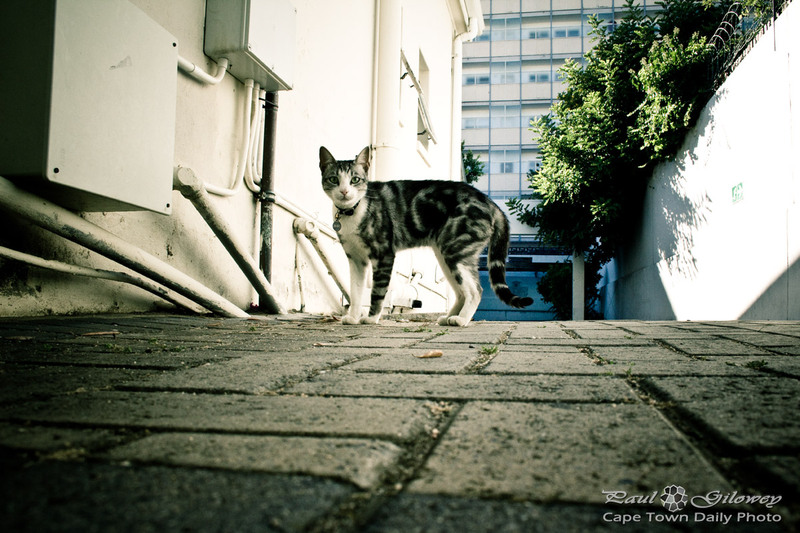 Posted in General and tagged cats, fauna on Wednesday, 14 March, 2012 by Paul. One may argue that every appendage is important, but in the case of a squirrel, the tail is probably the most important. It's used to keep them warm in winter, to provide shade in summer, it's a means of communication, a counterweight to balance with, a wing and parachute for jumping between branches, and a shield when fighting. Some would suggest that the Greeks gave them the name "Shadow Tail" because they use their tail to provide shade in summer. Don't believe it though - I overheard from a friend of a friend of a friend that all squirrels are part of a secret society, a club (if you will), that goes by the name Legion of the Shadow Tails. Yes. You should be worried. You just need to look at the pics below to know that they're up to something. 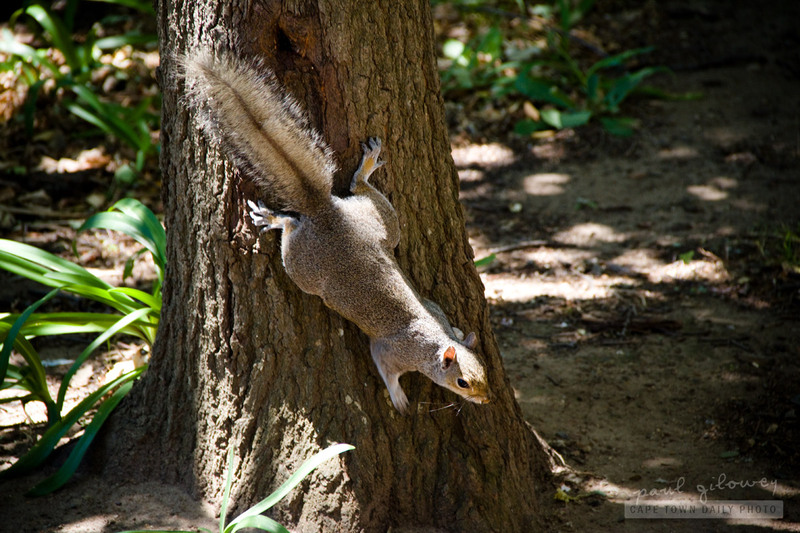 Posted in General and tagged fauna, squirrels on Monday, 6 February, 2012 by Paul. 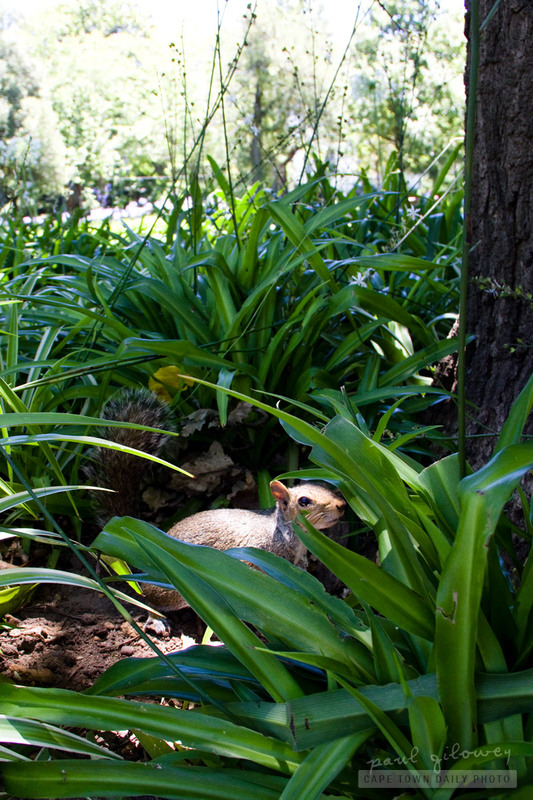 Places like the Company's Gardens and Kirstenbosch Botanical Gardens (where I spent my day at an IT conference) are full of these little fellas. 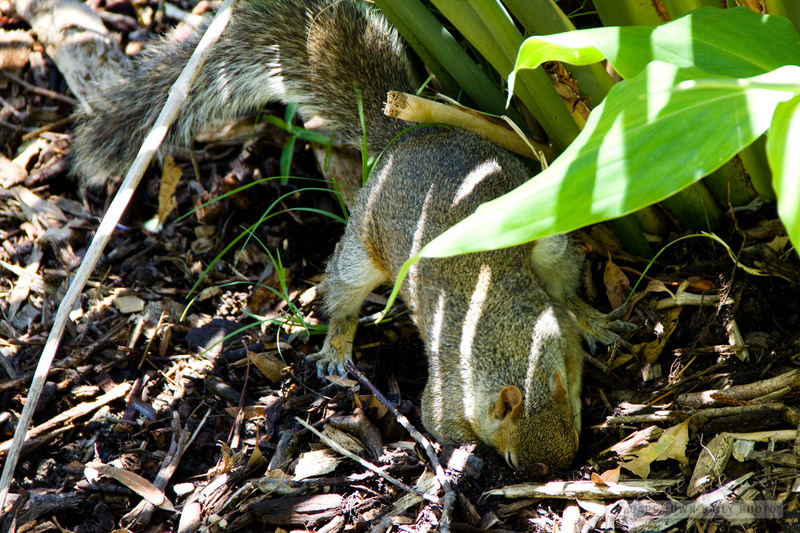 This squirrel spent at least three or four minutes digging (slightly frantically) in the soil. I assume he'd lost his prize nut. I don't think he found it. 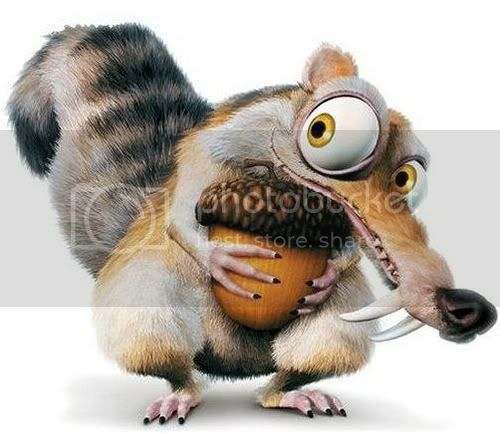 Posted in General and tagged fauna, squirrel on Thursday, 26 January, 2012 by Paul. This starfish reminded me of a well-known charity, Starfish, that operates in South Africa and works to support kids who've been orphaned as a result of the AIDS/HIV pandemic that South Africa is, sadly, known for. The charity, started by a group of young South Africans in 2001/2002, and is a registered non-profit organisation and as of 2001 are partnered with Global Fund, CIDA, PEPFAR and AUSAID. 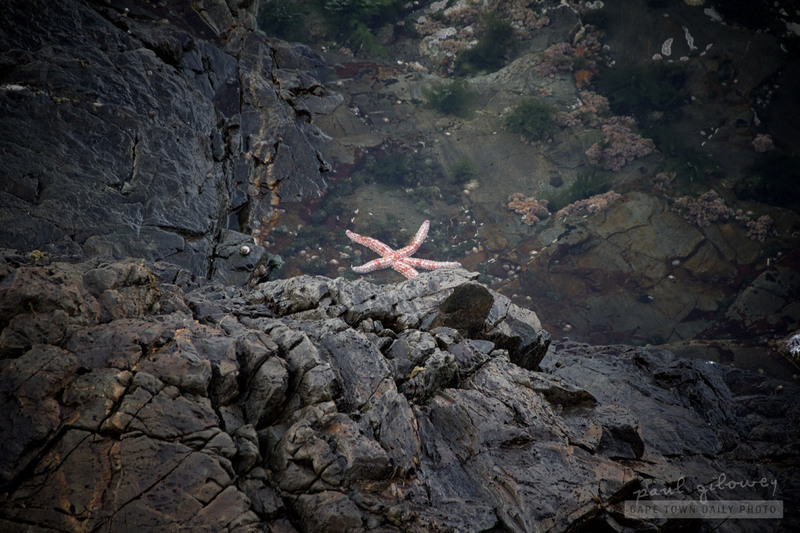 Posted in General and tagged fauna, starfish on Wednesday, 25 January, 2012 by Paul. 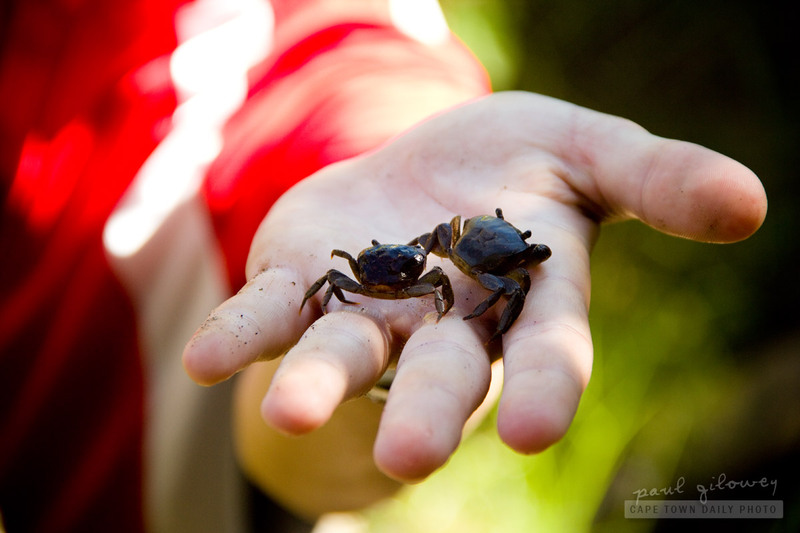 While walking in the Majik Forest a friend and I came across two 16- or 17-year-old boys who were taking a break from their cycle trip by catching crabs in the little stream that runs the length of the forest. This is what 16- or 17-year-old boys do. Do you remember catching crabs? Wasn't it fun? Posted in General and tagged crabs, fauna on Saturday, 21 January, 2012 by Paul. I found these two and their mom in the Company's Gardens in Cape Town. 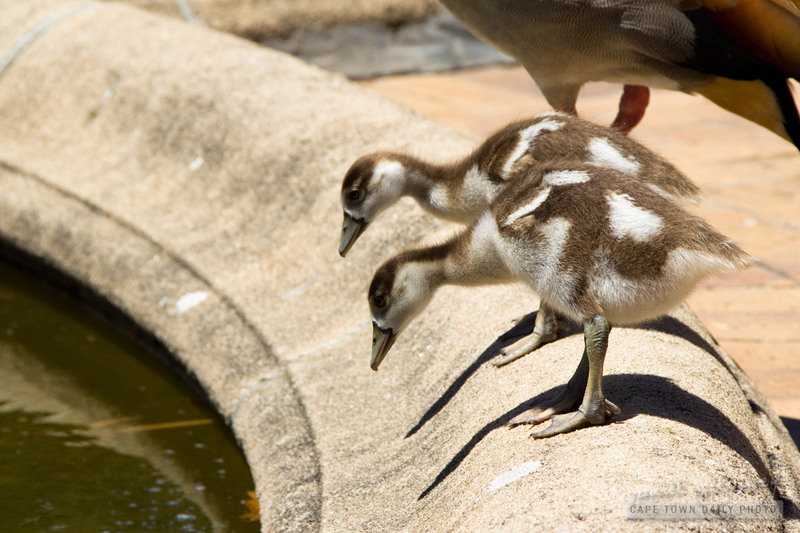 As I've whined before, it's been exceedingly hot in Cape Town this past week, so don't you think it nice of their mother to take them to the gardens for a dip? Posted in General and tagged fauna, geese on Thursday, 19 January, 2012 by Paul. It's been maddeningly hot in Cape Town for the last three days. Temperatures have exceeded 35°C - and in fact, right now it's 37°C in my neighbourhood! Take a look at our page the lists real-time weather conditions. I wonder how this tortoise feels about being out in the sun, and if it's perhaps preferable to be cold-blooded on days like this. 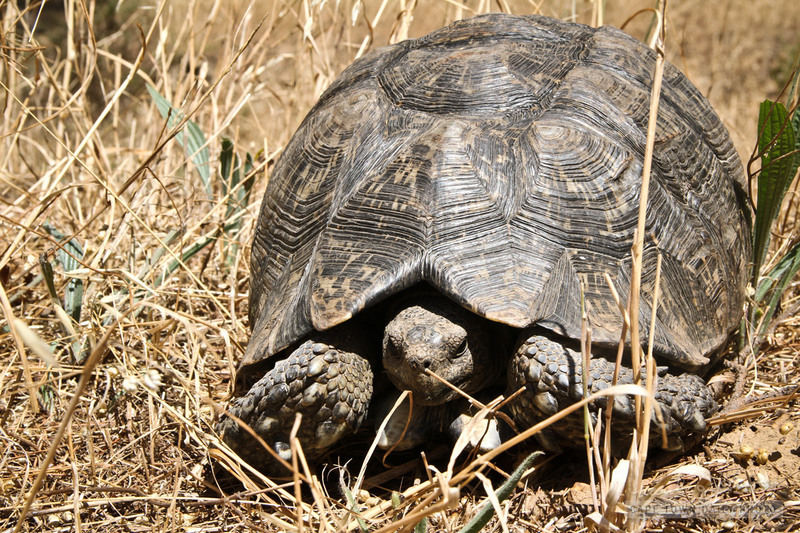 Posted in General and tagged fauna, tortoise, weather on Wednesday, 18 January, 2012 by Paul. I watched as a group of people fed these seagulls potato chips. I was really tempted to ask them to stop since everyone knows that feeding them just makes them more of a nuisance. But, as I thought this I instantly realised that my words would make no difference; so I left. 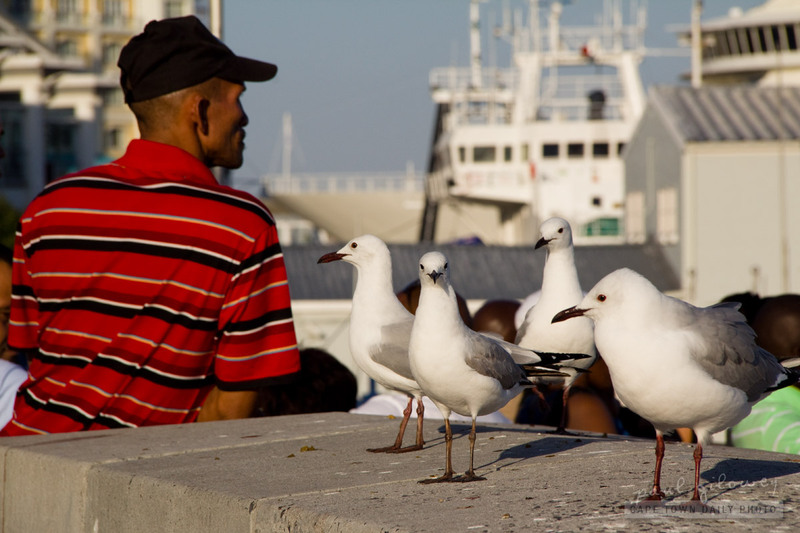 Posted in General and tagged birds, fauna, man, people, seagulls on Friday, 13 January, 2012 by Paul. Contrary to what I'd previously believed a study conduced in Japan revealed that peahens (like the dull-grey one on the left) aren't at all impressed by the size or brilliance of the peacock's plumage, nor by how neatly it's been pressed at the dry-cleaners. According to the study it's what the peacock says that makes all the difference. I have reason to believe this may too apply to the human race. 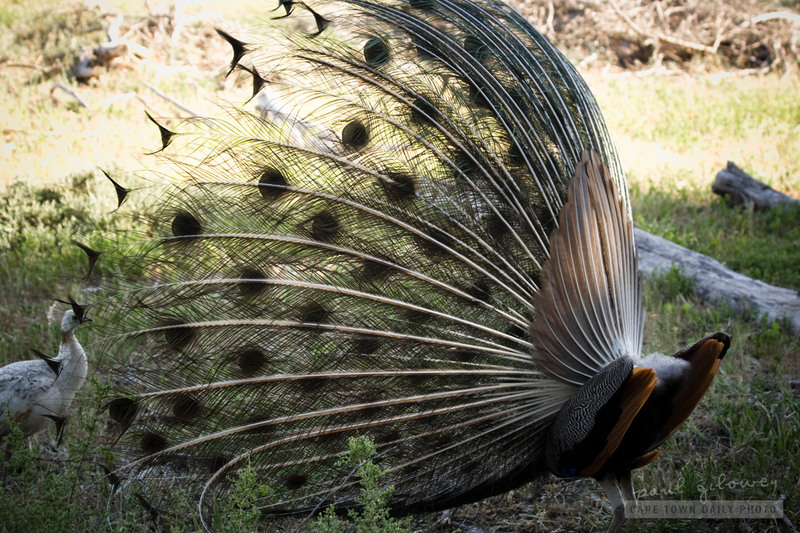 Posted in General and tagged birds, fauna, peacock on Thursday, 10 November, 2011 by Paul. 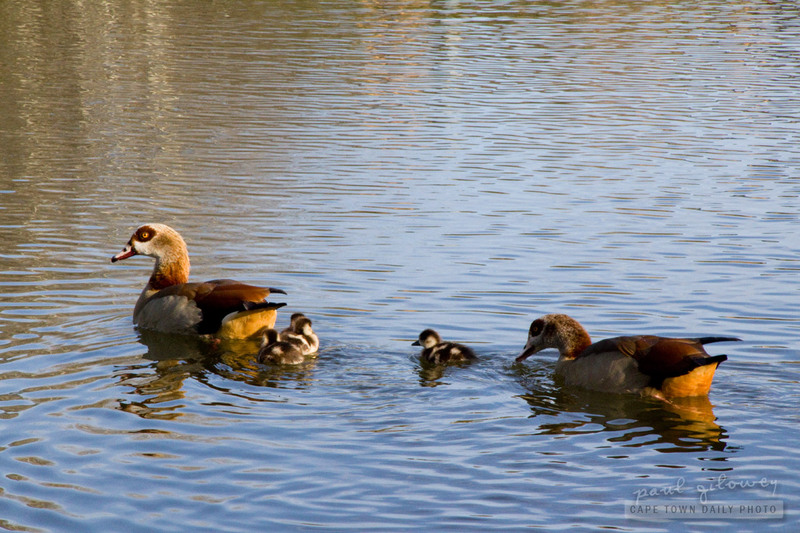 These parents with their four goslings looked awfully cute as they swam around the dam with the rising sun highlighting their brown colouring. They are beautiful to watch, however along with the beauty comes a contrast. 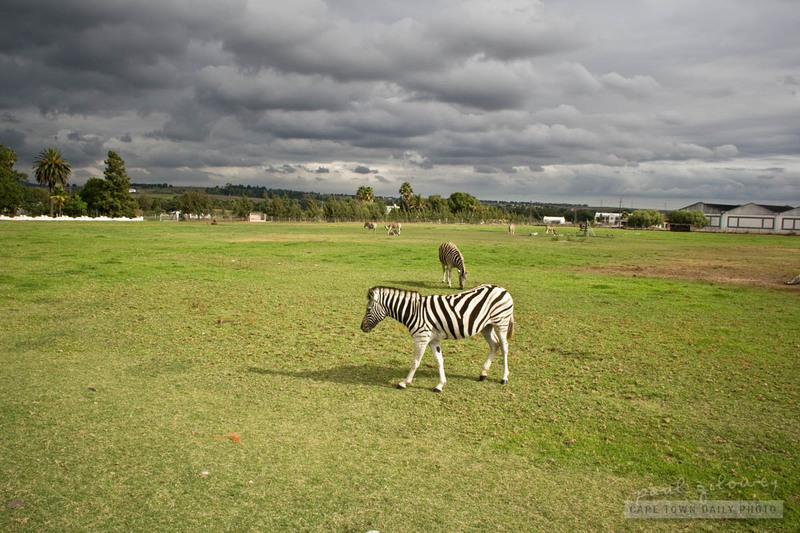 The dams in the Durbanville area (Sonstraal dam and Vygeboom dam) use to be surrounded with green grass and were previously home to families of the ordinary white ducks and geese. Over a period of a few years Egyptian gees started nesting in the area and soon overtook their white neighbours in number and appeared to push them out of the area. I remember watching the birds for some time and observing that the Egyptian gees appeared more hostile whereas the white ducks just looked clumsy and meek. Today there are hundreds of Egyptian geese in the area and since they typically eat grass, leaves and seeds, it appears as though their sheer number overgrazing has rendered the once-green grassy areas barren and sandy. It's sad really - those two dams specifically use to be such beautiful places. Posted in General and tagged dam, fauna, geese on Friday, 4 November, 2011 by Paul. Even though it's clinging to a piece of bamboo I'm pretty sure this red and black ball of feathers isn't called a Bamboo Bird. Does anyone want to take a guess at its real name? 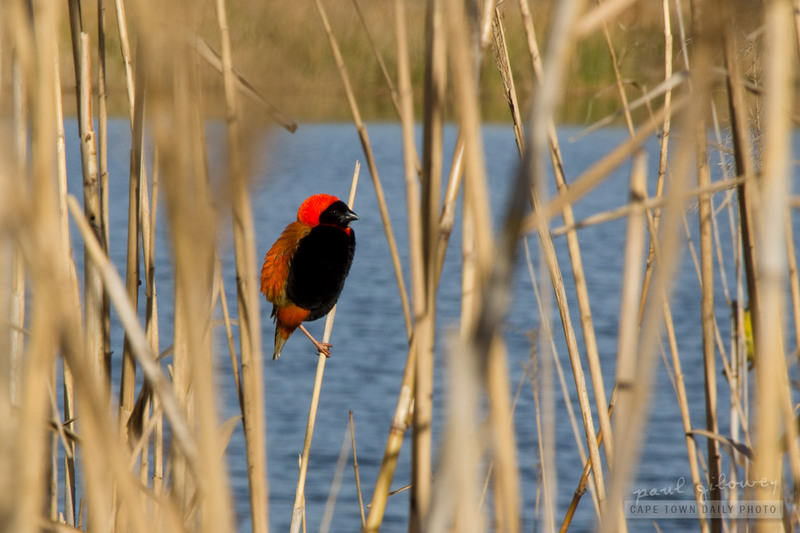 Posted in General and tagged birds, fauna on Tuesday, 1 November, 2011 by Paul. I'd never given much thought to the possible thought processes that occupy the brain of a lizard. 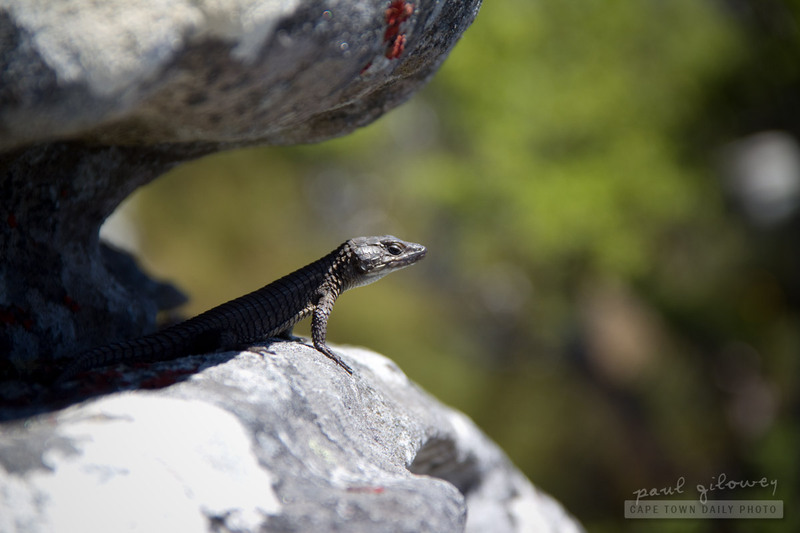 While staring at this photo for a while I began to wonder if the lizard was contemplating something, having some deep philosophical thought, or just keeping an eye out for predators. Imagine living a life in which you were constantly either trying to find food or dodging predators. Posted in General and tagged fauna on Thursday, 27 October, 2011 by Paul. 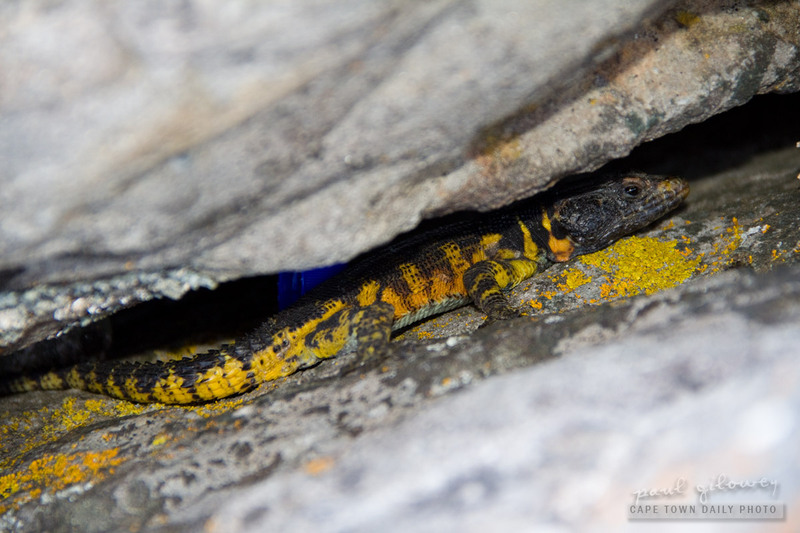 My keen-eyed nephew spotted this lizard hiding between two boulders near Table Mountain's upper cable station. Isn't it amazing how closely the creature mimics it's natural habitat? Posted in General and tagged fauna on Wednesday, 26 October, 2011 by Paul. A month or two ago a similar weaver built a nest on this same branch in our garden. Unfortunately, the nest wasn't secured well enough and it slid off the end of the branch and ended up on the grass below. I've watched this weaver build its nest over the past few days and, perhaps it's premature to say so, but I think it looks a little more secure than the previous one. That said, I sure hope that the little piece of grass that you can see wrapping over the thorn above the nest isn't the only thing keeping it in place! 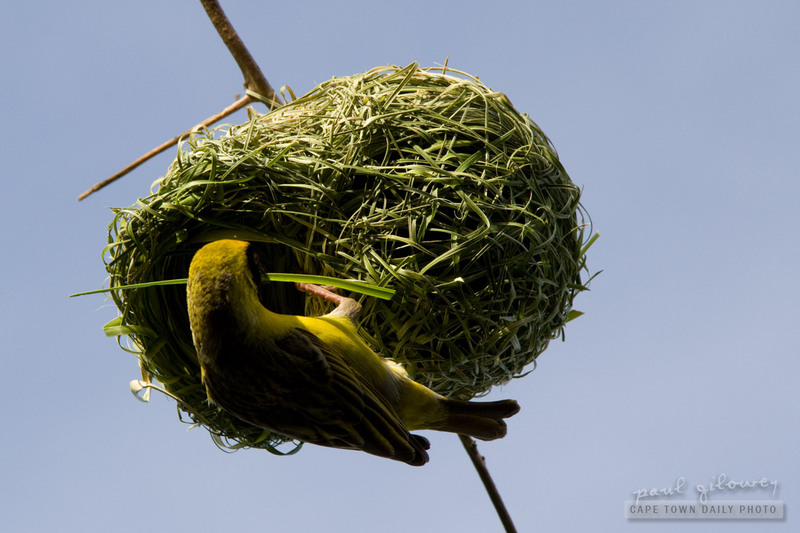 Posted in General and tagged birds, fauna, nests, yellow on Friday, 7 October, 2011 by Paul. If you're anything like me, even though signs like these are fairly prominent you've probably never read them - and in this case would be confused when lifeguards start waving at you as you bob about the ocean beyond the marker flags. 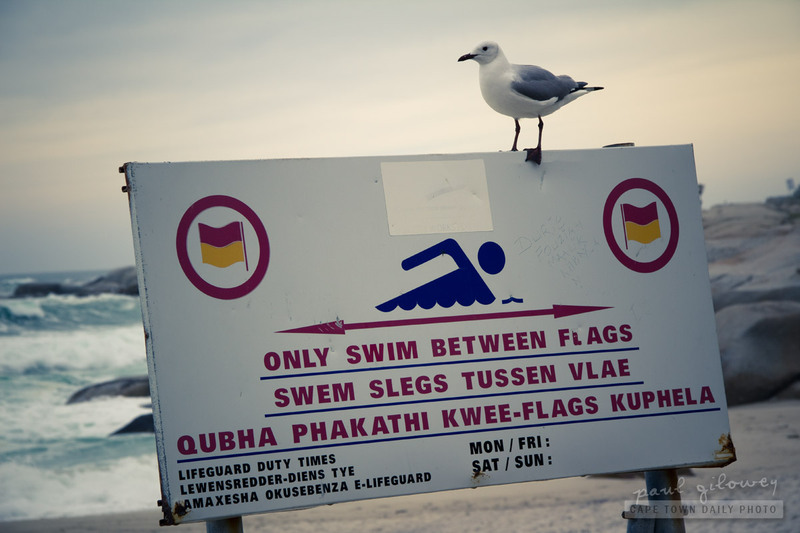 Posted in General and tagged beaches, birds, fauna, seagulls, signs on Thursday, 22 September, 2011 by Paul. 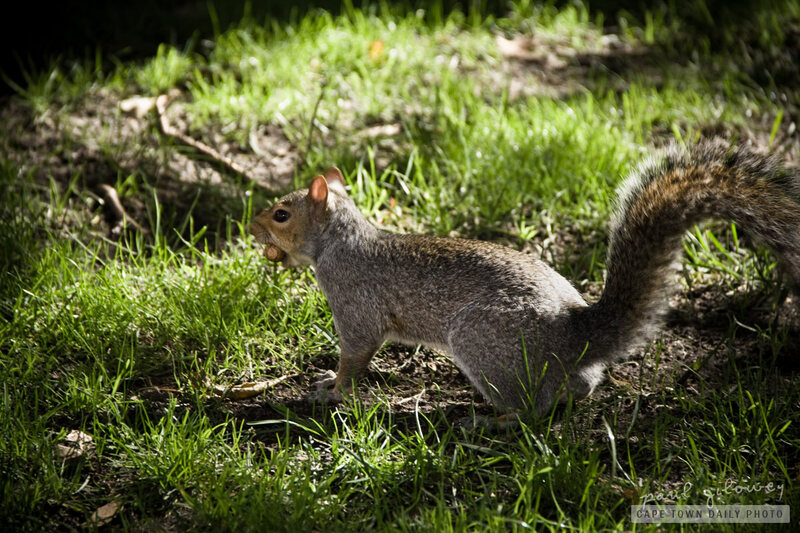 Posted in General and tagged fauna, squirrel on Friday, 9 September, 2011 by Paul. What I know about cattle could be considered dangerous. No, not that kind of dangerous, I mean I really don't know much about them except that they seem to love having their photos taken. The tag on this one's ear reads Magot, and while Kerry-Anne thought that the label may be a reference to the cow's owner's name, in fact, from what I can tell the Charpentier Magot is a breed of cow (and given the name) possibly originates from France. If you have any interesting facts about the Charpentier Magot, please do leave a comment on this post. There really appears to be very little about the breed on the Web! Posted in General and tagged cows, fauna on Thursday, 18 August, 2011 by Paul. 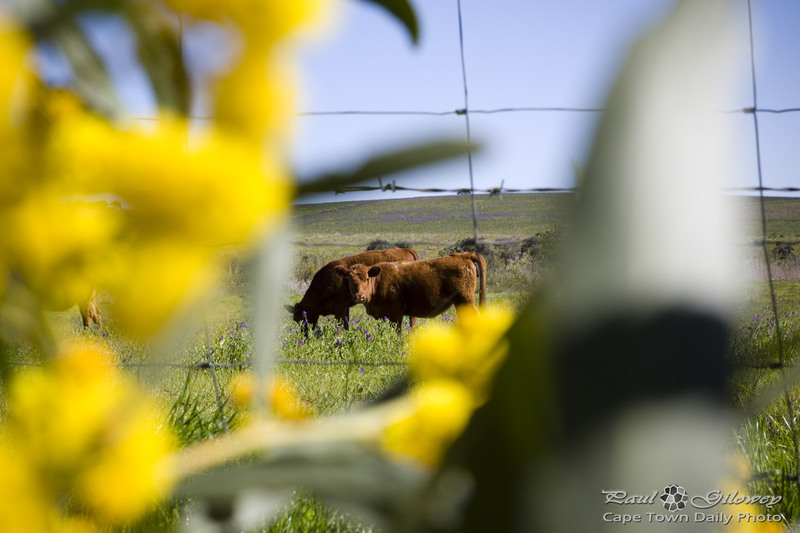 I took a little drive out the back of Durbanville, along the Malanshoogte road that passes by the Fair Cape dairy, on the Kuiperskraal farm (map). The small herd of cows in this photo were lying next to a little dam, peacefully swatting the odd fly with their respective tails. At first they were afraid, they were petrified, (they seemed to be) thinking "who's this strange tall beast standing by our side?" *. But, then curiosity set in and the young animals (feeling safe with superior numbers) slowly mustered into a semi-circle of curiosity. 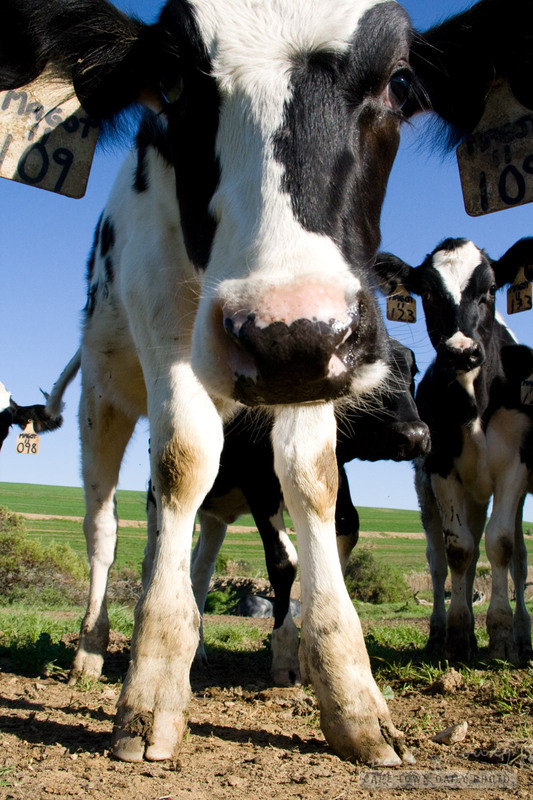 Posted in General and tagged cows, fauna on Wednesday, 17 August, 2011 by Paul. 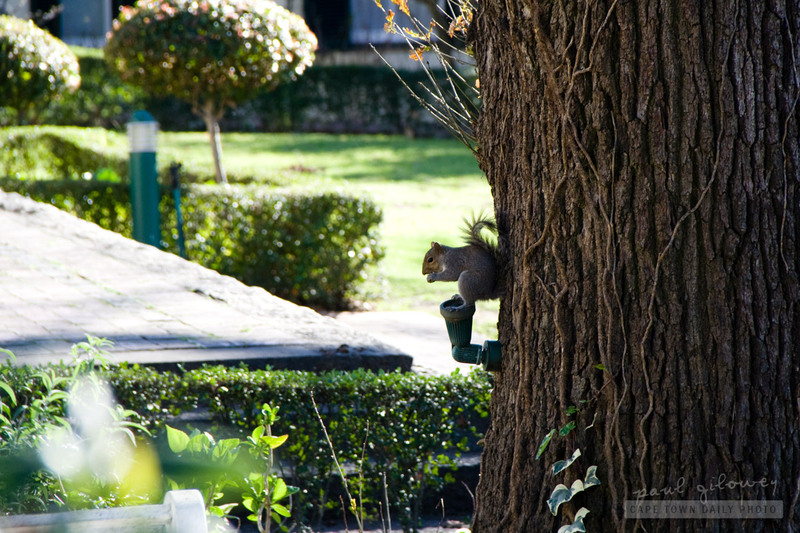 One of the best things to do on a warm afternoon is to sit outside on the lawn of the Mount Nelson hotel, sipping cooldrink and watching squirrels run to and fro grabbing acorns from the grass and dashing up the large oak trees to hide their treasured possession. 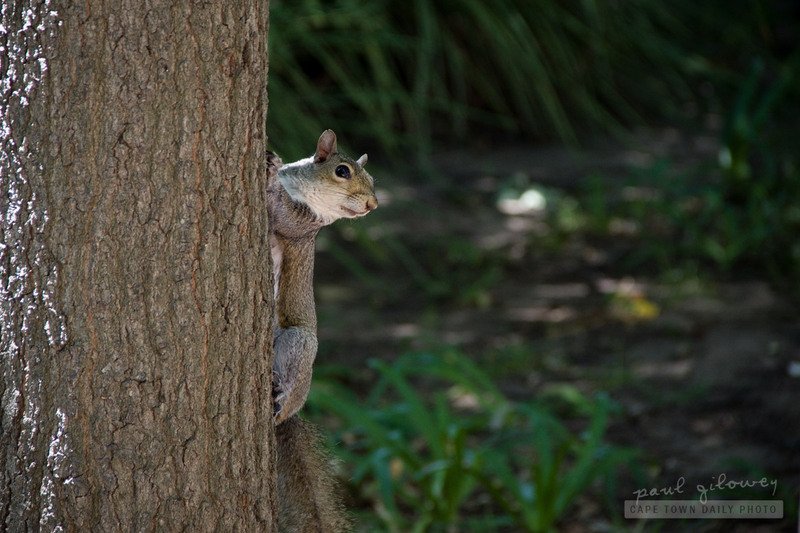 Squirrels, your probably know, hide their nuts in a stash. 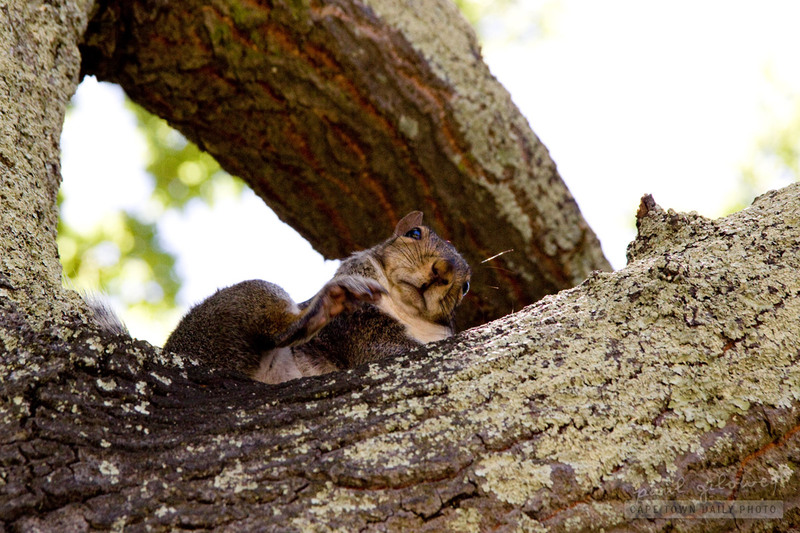 What you may not be aware of is that since certain acorns contain high levels of bitter tannins, squirrels may at times let the acorns rest for a long while in a place that allows water to filter them, slowly removing the nasty-tasting tannins. Isn't that clever!? 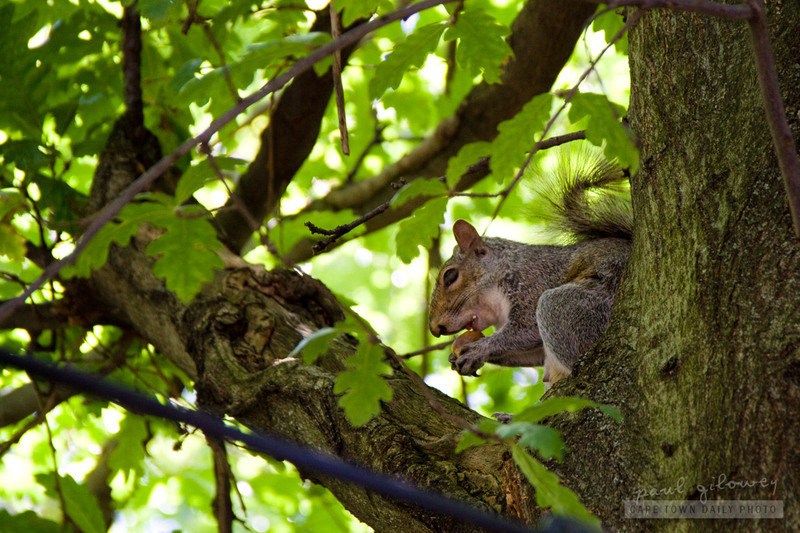 Posted in General and tagged fauna, squirrels on Tuesday, 10 May, 2011 by Paul. 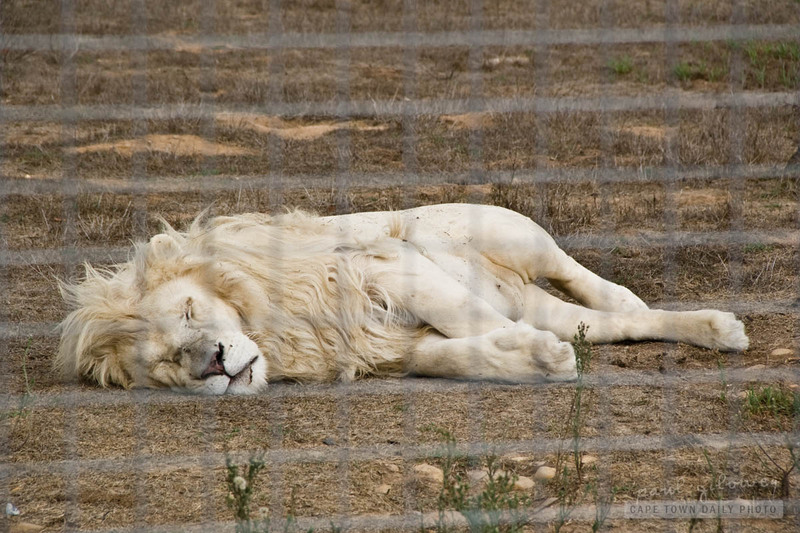 We visited the Cape Town Lion Park, "Home of the White Lion", and left feeling a fair bit depressed. 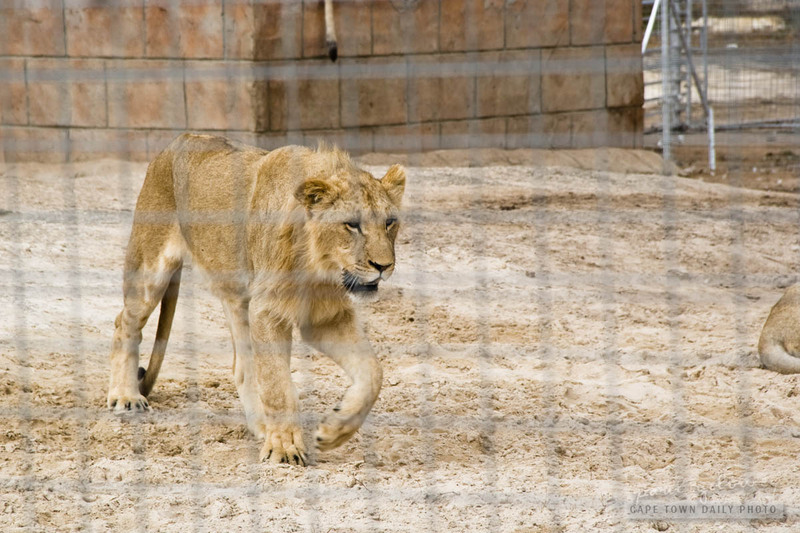 While clean and well fed, the lions are kept in sterile-like enclosures with little shade and little to keep them distracted from the blandness of the environment in which they find themselves. 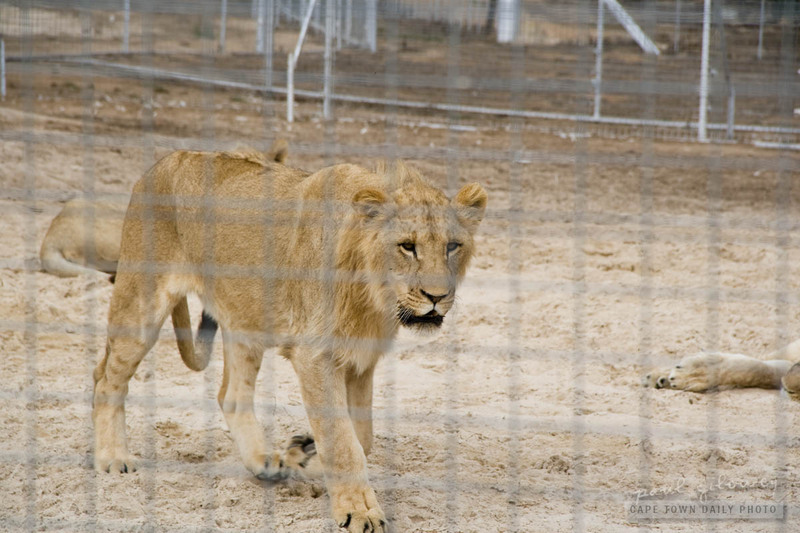 We paid our R70 entrance fee and walked the short distance to the enclosures to see the lions. Our visit lasted about 30 minutes, and the above aside, I can't say that it was worth the entrance fee - and can safely say that we won't feel the need to visit again. Just to clarify, I fully support rehabilitation and conservation projects - even those that preserve animals who could never be reintroduced into the wild. 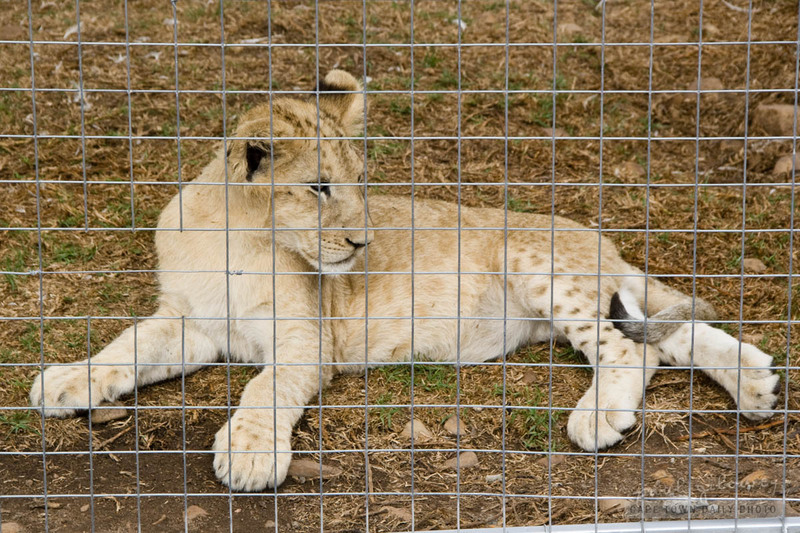 However, I found no information on Cape Town Lion Park's website, besides for a reference to "education" to indicate that they were involved in conservation. Posted in General and tagged fauna, lions on Sunday, 1 May, 2011 by Paul. We found this dominant male buck and his small harem :) of Fallow Deer alongside the R310, heading out of Stellenbosch to the Spier estate. I use the word "harem" in jest, but in reality the reference is pretty much spot on as there's one dominant male buck that has fought for the right to mate with the females on the herd. Although we spotted at least two males in the herd, the chance is great that only one of them will mate with the females. I believe it's a way of ensuring that the strongest survive and reproduce. 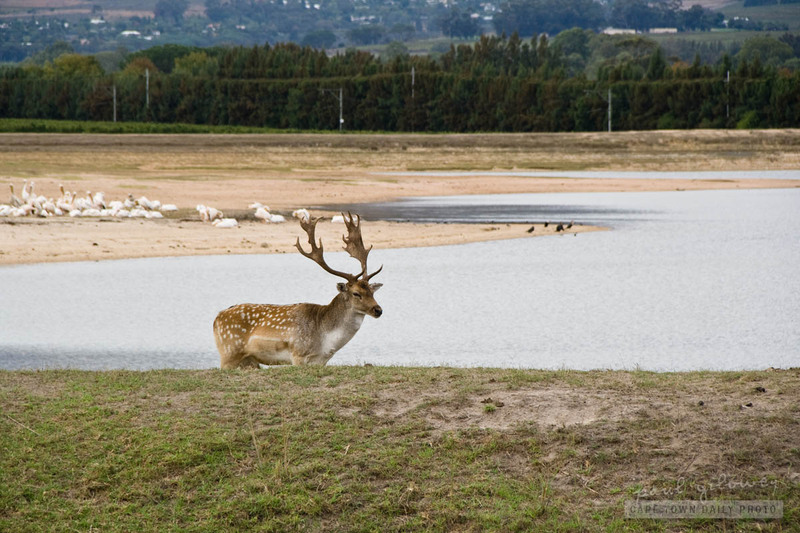 Do you know much about Fallow Deer, and exactly how one buck fights for dominance, and what happens when that male get's too old and is replaced by a younger, stronger, buck? Please leave a comment on this post! Posted in General and tagged deer, fauna on Saturday, 30 April, 2011 by Paul. 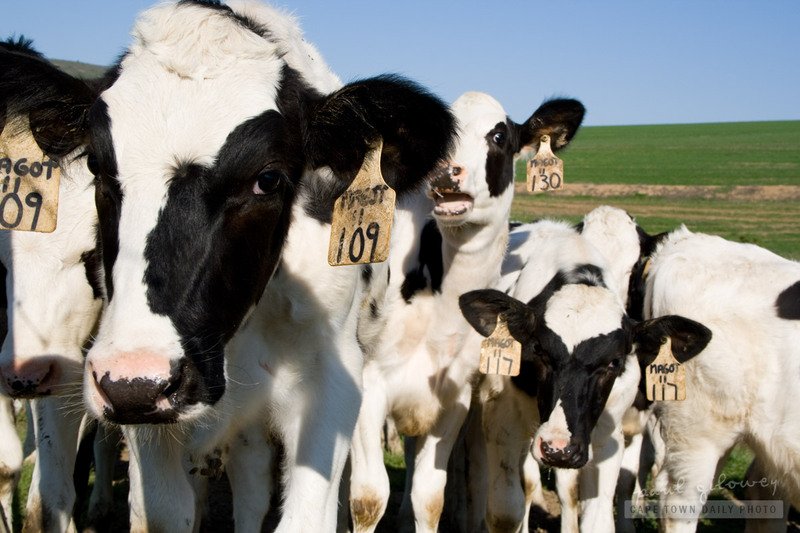 I spent a long while, to no avail, trying to figure out what breed of cattle these are. Do you perhaps know? I though they were Jersey cows... but Jerseys appear to be a little lighter in colour, and these seem just a little fluffy, don't they? As I approached the small herd, the big cow, and her wingman (wingwoman?) to the right of the photo, turned to stare me down. They sure do look mean, don't they? I was suddenly awfully glad that I was standing on the opposite side of the fence. 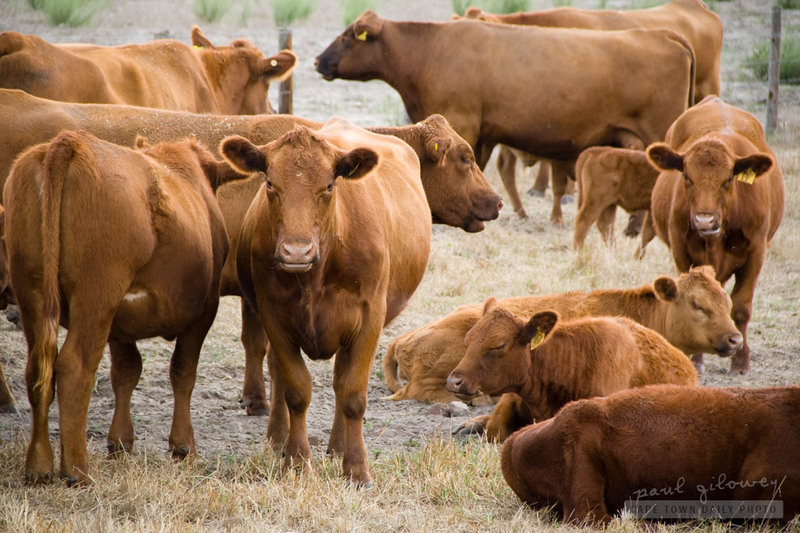 Posted in General and tagged brown, cattle, cows, fauna on Friday, 29 April, 2011 by Paul. Sticking more or less to the same theme as my previous post - this one shows a photo of Africa's largest antelope, the eland. Male elands can grow to a mass of about 900kg whereas females generally don't exceed 600kg (probably because they watch what they eat and go to gym more often). What I find amazing about the eland is that even though they weigh so much, from a standing position they're able to jump about 2.5 meters into the air! I guess that shows how muscular those legs and thighs are! Even though the Wikipedia article mentions that some South African farmers have switched from cattle to eland (due to eland being more hardy) I can't say that I've ever seen eland meat in the butchery or on a restaurant menu. Have you? 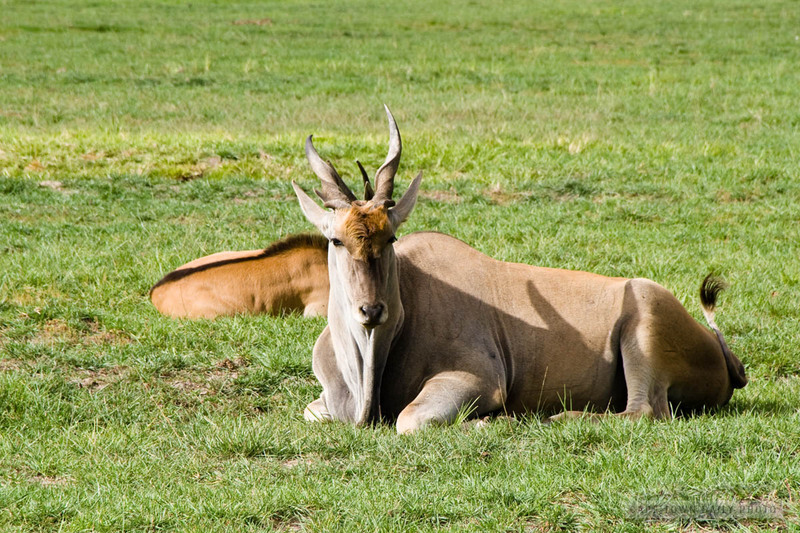 Posted in General and tagged antelope, eland, fauna on Monday, 18 April, 2011 by Paul. Ostriches are native to Africa and are (as I guess many of you will know) the largest bird in the world. At a hefty mass of around 120kg, and with proportionally tiny wings, it's no wonder that ostriches don't fly. What I found surprising however was that a bird of that mass is able to run at approximately 70kph! Not bad going hey!? If you do visit South Africa, you may come across ostrich fillet steak on our restaurant menus, or in our supermarkets. The meat looks a lot like beef steak; only darker in colour and with no visible fat. In fact, it's an extremely healthy alternative to beef steak since it tastes a lot like beef but contains very little fat or cholesterol. 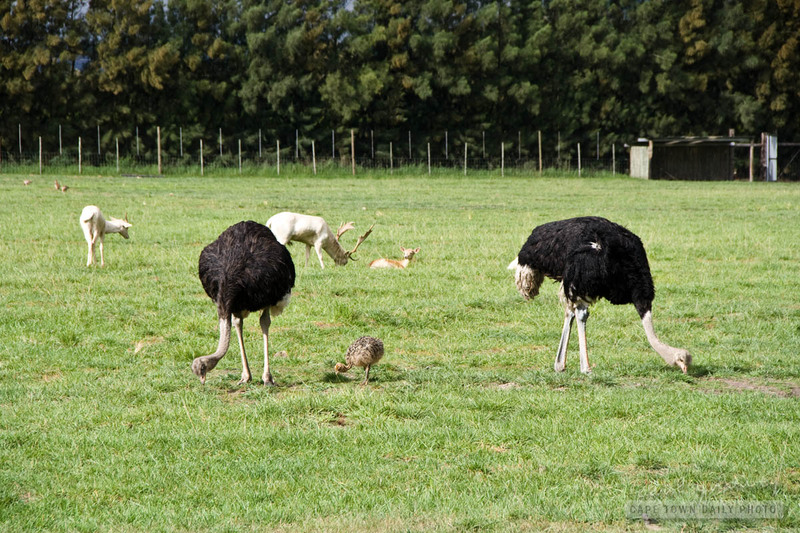 Posted in General and tagged bird, fauna, ostrich on Sunday, 17 April, 2011 by Paul. A zonkey is a cross between a zebra and a donkey... really, I'm not kidding. 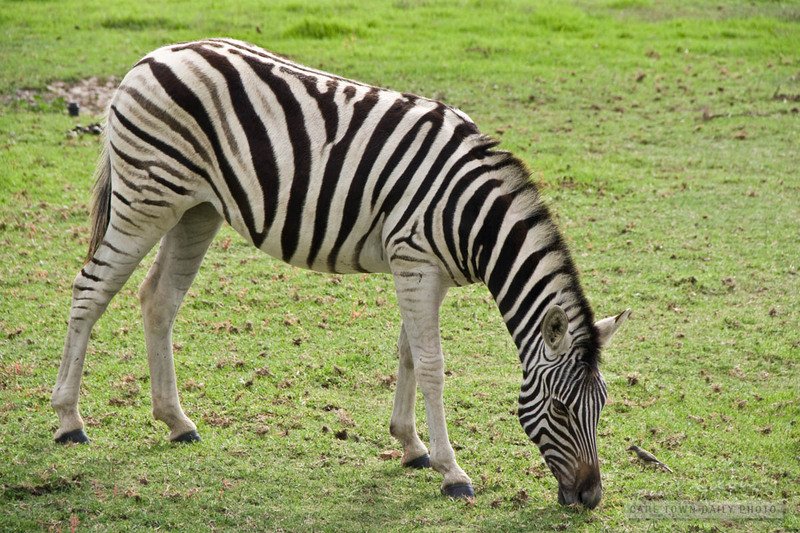 Okay, sometimes they're called a zebonkey, zebronkey, zebrinny, zebrula, zebrass, zedonk, or zeedonk. 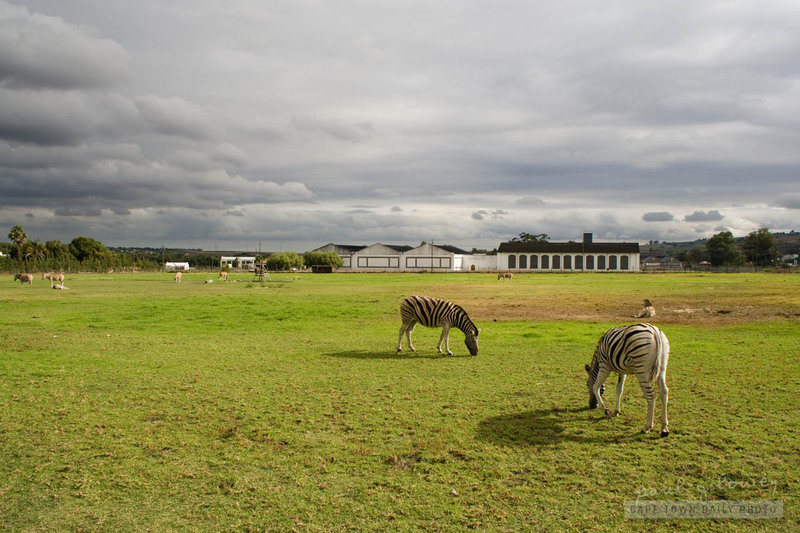 The equines in the photo of run-of-the-mill zebras that we found at the Vredenheim Wine Estate on the R310, close to the well-known Spier estate. Click on the images below to see more zebra pics. 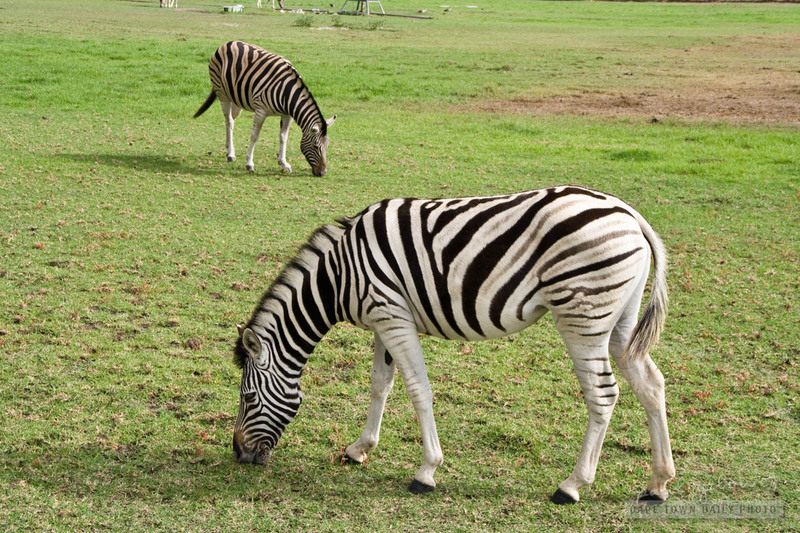 Posted in General and tagged animals, fauna, zebra on Saturday, 16 April, 2011 by Paul. I'll put it out there - I just don't trust seagulls. Have you noticed how they sit, "innocently" viewing the landscape. I tell you, they're up to no good. Just take a look at this photo! On the more serious side, did you know that seagulls can live for 20 or more years? 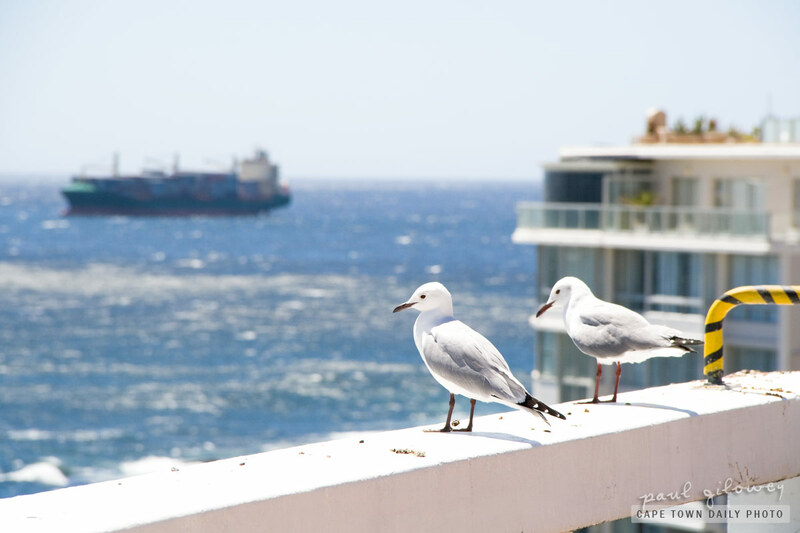 The same seagull has most probably been attacking your seaside picnics for 20 years! No wonder there are so many of them around! Posted in General and tagged birds, fauna on Thursday, 10 February, 2011 by Paul.